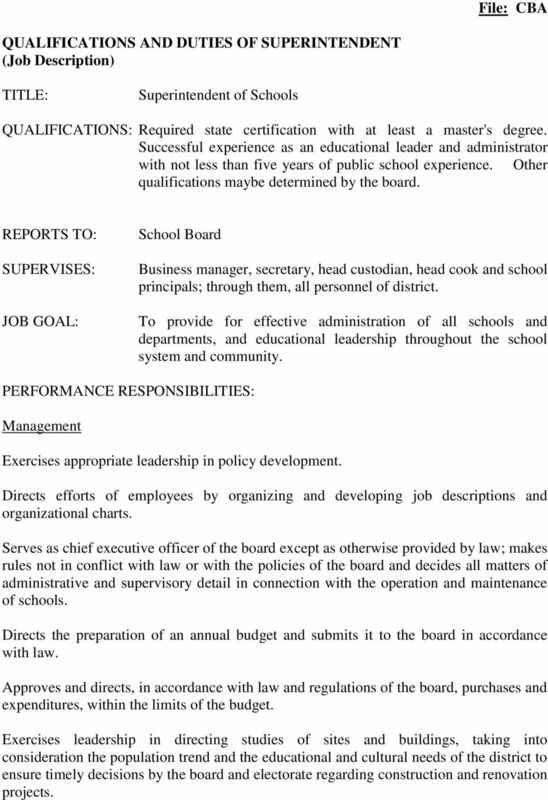 2 File: CB SCHOOL SUPERINTENDENT The Board shall appoint a superintendent for a term of not more than three years. This appointment will be secured through an explicit contractual agreement, which shall state the term of the contract, compensation and other benefits, including vacation period, and other conditions of employment. The Board, by the January board meeting, will annually review the superintendent s performance. Following the superintendent s annual review, the Board should establish goals for the superintendent to accomplish within the next year. Reappointment of the superintendent shall be accomplished at the January board meeting, or written notice shall be presented to the superintendent at that time if his services are no longer desired. 3 File: CBA QUALIFICATIONS AND DUTIES OF SUPERINTENDENT (Job Description) TITLE: Superintendent of Schools QUALIFICATIONS: Required state certification with at least a master's degree. Successful experience as an educational leader and administrator with not less than five years of public school experience. Other qualifications maybe determined by the board. REPORTS TO: SUPERVISES: JOB GOAL: School Board Business manager, secretary, head custodian, head cook and school principals; through them, all personnel of district. To provide for effective administration of all schools and departments, and educational leadership throughout the school system and community. PERFORMANCE RESPONSIBILITIES: Management Exercises appropriate leadership in policy development. Directs efforts of employees by organizing and developing job descriptions and organizational charts. 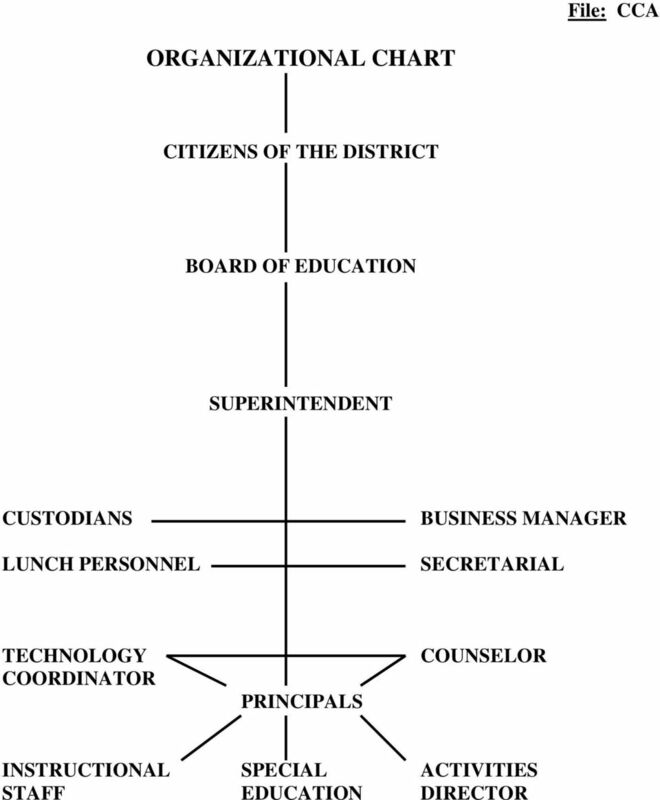 Serves as chief executive officer of the board except as otherwise provided by law; makes rules not in conflict with law or with the policies of the board and decides all matters of administrative and supervisory detail in connection with the operation and maintenance of schools. Directs the preparation of an annual budget and submits it to the board in accordance with law. Approves and directs, in accordance with law and regulations of the board, purchases and expenditures, within the limits of the budget. Exercises leadership in directing studies of sites and buildings, taking into consideration the population trend and the educational and cultural needs of the district to ensure timely decisions by the board and electorate regarding construction and renovation projects. 4 Supervises the establishment or modification of school attendance and transportation areas subject to approval of the board. Implements proper attendance and discipline policies of students. Implements policies regarding employees' leaves as well as all other policies of the board. 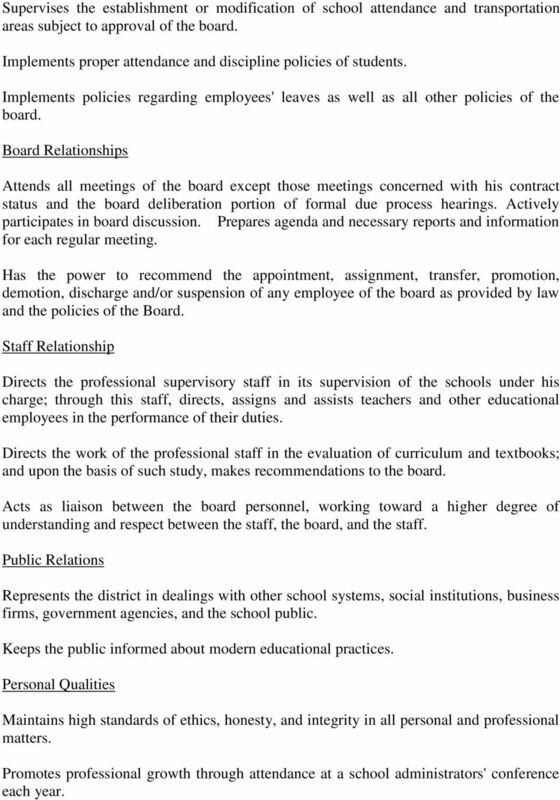 Board Relationships Attends all meetings of the board except those meetings concerned with his contract status and the board deliberation portion of formal due process hearings. Actively participates in board discussion. Prepares agenda and necessary reports and information for each regular meeting. Has the power to recommend the appointment, assignment, transfer, promotion, demotion, discharge and/or suspension of any employee of the board as provided by law and the policies of the Board. Staff Relationship Directs the professional supervisory staff in its supervision of the schools under his charge; through this staff, directs, assigns and assists teachers and other educational employees in the performance of their duties. Directs the work of the professional staff in the evaluation of curriculum and textbooks; and upon the basis of such study, makes recommendations to the board. Acts as liaison between the board personnel, working toward a higher degree of understanding and respect between the staff, the board, and the staff. Public Relations Represents the district in dealings with other school systems, social institutions, business firms, government agencies, and the school public. Keeps the public informed about modern educational practices. Personal Qualities Maintains high standards of ethics, honesty, and integrity in all personal and professional matters. Promotes professional growth through attendance at a school administrators' conference each year. 5 Uses effective communication skills in dealing with board, staff, and public. Other Performs such other duties as determined by the board. 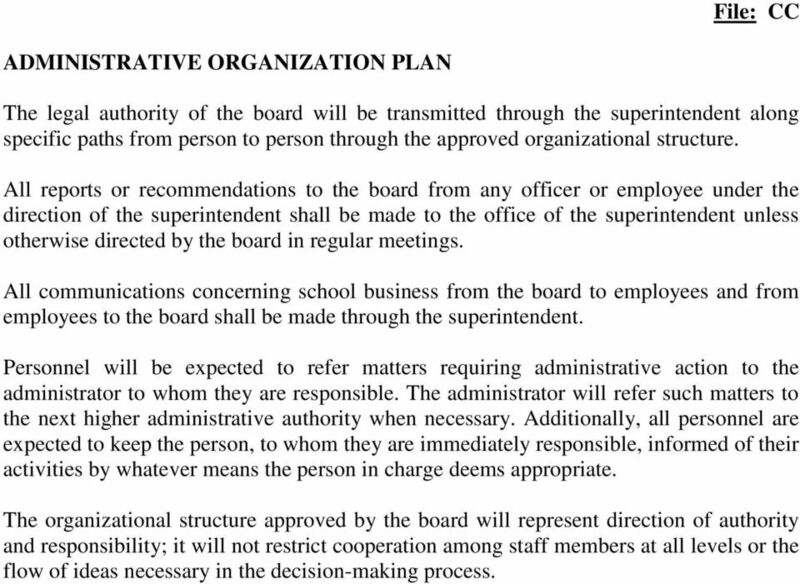 6 File: CC ADMINISTRATIVE ORGANIZATION PLAN The legal authority of the board will be transmitted through the superintendent along specific paths from person to person through the approved organizational structure. All reports or recommendations to the board from any officer or employee under the direction of the superintendent shall be made to the office of the superintendent unless otherwise directed by the board in regular meetings. All communications concerning school business from the board to employees and from employees to the board shall be made through the superintendent. Personnel will be expected to refer matters requiring administrative action to the administrator to whom they are responsible. The administrator will refer such matters to the next higher administrative authority when necessary. Additionally, all personnel are expected to keep the person, to whom they are immediately responsible, informed of their activities by whatever means the person in charge deems appropriate. The organizational structure approved by the board will represent direction of authority and responsibility; it will not restrict cooperation among staff members at all levels or the flow of ideas necessary in the decision-making process. 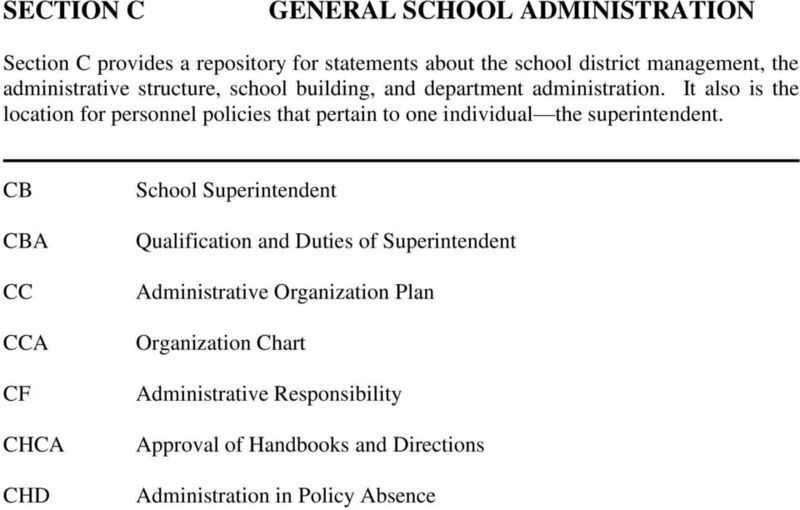 8 File: CF ADMINISTRATIVE RESPONSIBILITY Acting with the approval of the superintendent, administrators shall be responsible for supervising and directing staff assigned to them and for administering district policies and regulations within their administrative units. Within the framework of board policies and in compliance regulations set by the superintendent, administrators may establish and enforce regulations essential for the efficient operation of their administrative units. 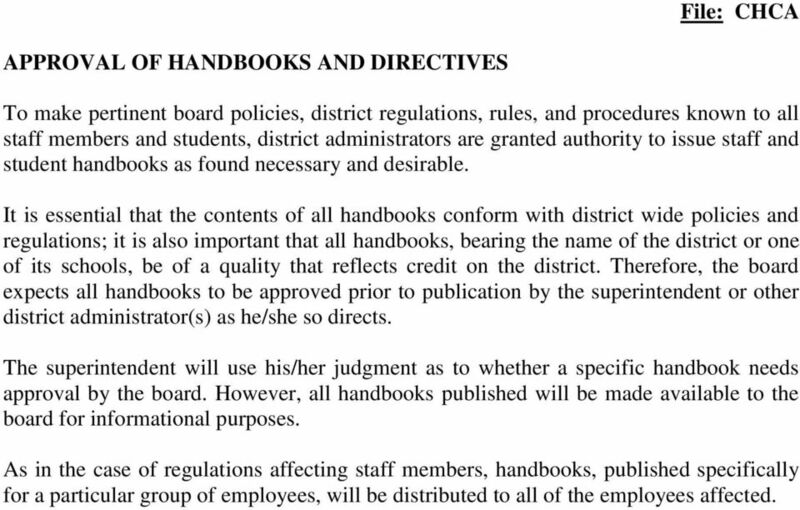 9 File: CHCA APPROVAL OF HANDBOOKS AND DIRECTIVES To make pertinent board policies, district regulations, rules, and procedures known to all staff members and students, district administrators are granted authority to issue staff and student handbooks as found necessary and desirable. It is essential that the contents of all handbooks conform with district wide policies and regulations; it is also important that all handbooks, bearing the name of the district or one of its schools, be of a quality that reflects credit on the district. Therefore, the board expects all handbooks to be approved prior to publication by the superintendent or other district administrator(s) as he/she so directs. The superintendent will use his/her judgment as to whether a specific handbook needs approval by the board. However, all handbooks published will be made available to the board for informational purposes. As in the case of regulations affecting staff members, handbooks, published specifically for a particular group of employees, will be distributed to all of the employees affected. 10 File: CHD ADMINISTRATION IN POLICY ABSENSE In the absence of board policy specifically covering any action that the superintendent feels he must take for the orderly execution of his duties, he may take temporary action that he feels will be in harmony with the overall policy of the board. However, the superintendent will not be free to act when the action involves a duty of the board that by law cannot be delegated. In each case in which the superintendent must take such action, he will present the matter to the board for its consideration at its next meeting. Section C provides a repository for statements about ethics and handbooks. 1320 DUTIES OF SCHOOL BUSINESS ADMINISTRATOR/ BOARD SECRETARY. 1. A valid certificate as a School Business Administrator. The School Nurse shall be responsible to the building principal for the performance of all duties. 1. The Director of Human Resources (Staffing) shall have the general qualifications of a teacher as prescribed by the State Department of Education. DIRECTOR OF HUMAN RESOURCES (STAFFING) A. QUALIFICATIONS: 1. The Director of Human Resources (Staffing) shall have the general qualifications of a teacher as prescribed by the State Department of Education. I. EXECUTIVE AUTHORITY KECK SCHOOL OF MEDICINE GOVERNANCE DOCUMENT June 20, 2011 As a non-profit public benefit corporation, the University of Southern California (USC) is governed by the Board of Trustees. AN ACT. 441, 442, 443, and 444(B)(1), to enact R.S. 17:418 and 532(C), and to repeal R.S. Chapter 2.04 CITY MANAGER Sections: 2.04.010 Office created Appointment Qualifications Term. 2.04.020 Eligibility. 2.04.030 Bond. 2.04.040 Temporary City Manager. 2.04.050 Compensation and expense reimbursement. 1. The Library Management Systems Administrator shall have the general qualifications of a teacher as prescribed by the State Department of Education. LIBRARY MANAGEMENT SYSTEMS ADMINISTRATOR A. QUALIFICATIONS: 1. The Library Management Systems Administrator shall have the general qualifications of a teacher as prescribed by the State Department of Education. I. COMMITTEE PURPOSES GARMIN LTD. Compensation Committee Charter (Amended and Restated as of July 25, 2014) The Compensation Committee is appointed by the Board of Directors (the "Board") of Garmin Ltd.